Today marks a special day for me. March 20th is just another day to so many of you, but for me, it is the day that marks a huge change in my life. Two years ago today, I made a decision. That decision has stuck with me every single day for the last two years. That decision is the best choice I have ever made in my life. That decision saved my life. I chose to stop starving myself. I chose to start treating my body with respect and giving it exercise. I chose to live my healthiest and best life possible so I could be present for my family. I chose to stop thinking negative thoughts. I chose to eat dinner with my family. Two years ago today, I chose LIFE. When I chose to live a healthy life, I wasn’t necessarily choosing recovery. I didn’t know if that would ever happen. But I knew that I did have the power to choose my actions each day. Whether those actions would lead to recovery, I didn’t know. Over time, those actions became habit. And then they became a part of my lifestyle. And then I realized – Hey! I think this means I’m in recovery! It hasn’t been an easy road. But it has been a road I haven’t even considered turning back on. There is so much I have learned about myself in the last two years and I’ve gotten farther and farther away from eating disorder hell, and I just wanted to share some of it with you today. 1. I learned that I will always have an eating disorder. Not many days go by that I don’t face some sort of struggle with food and eating. Some days, I consider skipping my mid-morning snack. Sometimes, I consider eating a bunch of junk out of boredom. Sometimes I’m pissed off or sad and just feel like I need a cupcake. It is something I will always struggle with. Something that was a part of my life for so long doesn’t just go away. 2. I learned that not everyone is able to recover the way I have. I know that not everyone can just wake up one day and choose to be a healthy being. Although, I do believe that everyone has the ability to make their own healthy choices, so many people need a little extra push, and that is just fine. Most people who suffer from disordered eating, require some extensive therapy, and there is no fault in that. My way may not be the best way. What works for me, may not be what works for you! Everyone has a different way. 3. I learned that relapses will happen. Like I said before, there are days when I am really tested with my old habits. And I will be the first to admit that a couple times, I did give into the pressure and the voices in my head. No one is perfect. I don’t know any eating disordered person who has gone through recovery without falling off the wagon, just the same as any type of addict. 4. I learned that relapses are not the end of the world. And because I know that relapses are pretty much inevitable, I also know that life will continue. A relapse does not mean that you are a failure. It doesn’t mean that you were weak. It just means that you are human, and you had a difficult time getting through a specific situation without your past habits. The key is how you handle a relapse. Just because you struggled, doesn’t mean you are not in recovery anymore. Instead of dwelling on your “hiccup” for days and days on end, realize that you have the ability to wake up that next day, that next hour, that next moment … and make a change. Up to that point, you had made progress. Remember that progress and continue your walk forward along the path of a healthy life. 5. I learned that I am 100% in charge of the way I respond to an emotion. I know that if I have a bad day, I am absolutely responsible for the way I handle it. No one is forcing me to handle it with a cupcake in my mouth. No one is telling me that in order to control my life, I have to stop eating. No one is in charge is my emotions besides myself! That is my lifelong responsibility, and I can’t blame anyone else besides myself for my actions in regard to any emotions I may be experience. 6. That my voice is powerful. Every time I get an email, a comment, or a message from someone telling me I was able to help them with something they were struggling with, I felt as though my voice was worth something. My experiences, just like yours, and priceless. I was put on this Earth to help people. 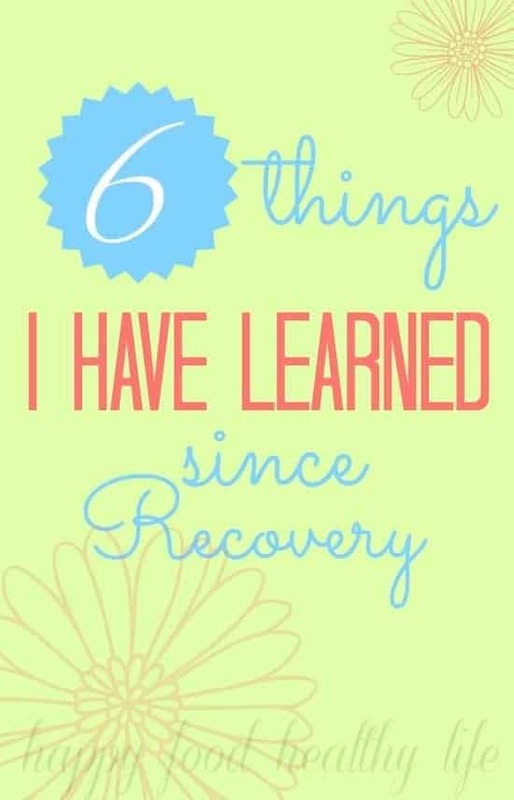 I am so forever grateful for the experiences and strength that I have had in my recovery. Because of them, I have been able to share stories, hardships, and successes with so many people. I might just be one person in this gigantic world. But I am one person who can make a huge difference. My voice is powerful! So two years ago wasn’t the day that I chose to leave my eating disorder behind and recover. But it was the day that I chose life. Gosh, thanks! I appreciate you. Aw Marla, thank you for your kind words. I am forever grateful for the people in my life that I am able to help, because in all actuality, they are helping me as an inspiration. Congratulations Holly. I know you have and will continue to inspire others to do the same. That is my hope. Thank you for your support, Jennie. Happy two years Holly. That is a great thing! And #1, heck yeah. Thank you Dorothy! It’s been a rocky path, but it’s one I’d stumble through over and over again until it starts to get a little smoother. So worth the fight!